Zhang, J. C., Wang, C. T., Wang, C. T., Wang, S. X., and Sun, B. G. (2019). "Changes in components of aqueous and non-aqueous extracts from sea buckthorn seed residues through solid state fermentation of Monascus purpureus," BioRes. 14(1), 2197-2215. The feasibility of solid-state fermentation was studied for sea buckthorn seed residues (SBSR). Effects of different fermentation parameters were evaluated regarding the levels of biomass and compounds in aqueous and non-aqueous extracts. In the latent and logarithmic phases of fermentation, the total phenols and flavonoids were increased. The microbes’ decomposition on fibrous matter allowed the active components to be fully extracted. The changes of total sugar levels had a contrary trend with the changes of total phenol and flavonoid contents. The monosaccharide and polypeptide contents decreased dramatically and then kept steady along with the fermentation. Unsuitable environments led to weak growth of the fungi, limited enzyme contents, low enzyme activity, and a poor degradation of the substrates. The active compounds considered in the study were protected, and the contents reached a maximum under conditions that were usually not suitable for the fungal growth. The chemical structure was another important factor influencing the content and stability of the compounds. The content of procyanidins decreased dramatically because of its sensitivity to heat and alkaline environments. Antioxidant abilities of SBSR extracts, both aqueous and non-aqueous, increased after fermentation. These results reflected a possibility to recycle SBSR for further use in the food industry. Sea buckthorn seed residues (SBSR) have been the main by-product of sea buckthorn seed oil processing. These are generally regarded as inexpensive animal feed or organic fertilizers (Arimboor and Arumughan 2012). However, some pharmacological investigations have shown that the extracts of these seed residues still have hypoglycemic, hypotriglyceridemic, and antioxidant properties (Chauhan et al. 2007; Koyama et al. 2009; Zhang et al. 2010a,b), owing to chemically active constituents such as flavonoids, procyanidins, and alkaloids. The SBSR polyphenols extracted with subcritical water show excellent ability to scavenge ABTS (2,2′-azino-bis(3-ethylbenzthiazoline-6-sulphonic acid)) (Gong et al. 2015). Zhang et al. 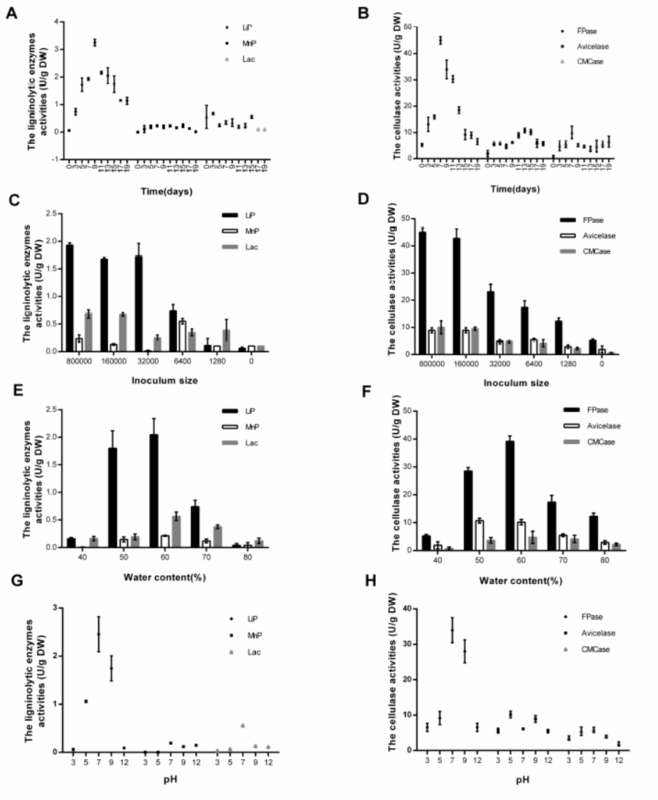 (2010a, b) reported that the total flavonoids of SBSR increase the antioxidant activities markedly in streptozotocin-induced diabetic rats (Wang et al. 2011). Arimboor and Arumughan et al. (2012) studied the most antioxidant fraction of sea buckthorn seed and profiled the major flavonoid glycosides. Despite the recent interest, large-scale applications of the SBSR are limited. With the increased awareness of resource reuse, the industrialized utilization of SBSR is a new research focus. Fermentation, especially solid-state fermentation (SSF), is one of the most rapidly advancing applications to recycle organic wastes (Singhania et al. 2009; Ushakova et al. 2009). During fermentation, long chains of compounds (e.g., cellulose, proteins, and starch) can be cut into shorter chains with lower molecular mass. The nutrient availability, texture, and the physicochemical characteristics of the substrates can be changed to improve the functional properties and nutraceutical values (Xiao et al. 2015). Biological activities, such as antioxidant activity, can be increased after treatment with microbes (Torino et al. 2013). The fermentation of kinmen sorghum liquor waste increased the antioxidant activity, which indicated a considerable potential for use in functional foods (Huang et al. 2013). According to Wang et al. (2016), the co-fermentation of Psidium guajava L. leaves resulted in improved antioxidant activities. Moreover, many enzymes have been produced through fermentation of food or industry wastes. Feather waste was used to produce keratinases by Aspergillus niger in SSF (Mazotto et al. 2013). Glucoamylases and proteases were produced by SSF of waste bread pieces (Melikoglu et al. 2013). Filamentous fungi are the most suitable microorganisms for SSF (Pandey et al. 2000; Rodriguez and Sanroman 2006; Ferreira et al. 2016). The yeasts are the second most well-used microbes, as they can grow in a low water activity condition. Some species of bacteria have been utilized to degrade a wide range of substrates (Singhania et al. 2009). For example, Bacillus subtilis 8130 was used to degrade sea buckthorn cake to improve its sorption quality (Ushakova et al. 2009). Bacillus thuringiensis and Lactobacillus sp. are also commonly used in SSF (Ballardo et al. 2017; Qian et al. 2018). Monascus is a homothallic fungus classified into the class Ascomycetes and family Monascaceae. It has made great contributions within a wide range of the food industry. Monascus can decompose lignin and cellulose effectively by secreting specific ligninolytic and cellulosic enzymes. Lignin peroxidase (LiP) (E.C. 1.11.1.14), manganese peroxidase (MnP) (E.C. 1.11.1.13), and laccase (Lac) (E.C. 1.10.3.2) are major enzymes involved in lignin degradation. Cellulosic enzymes include endoglucanase (CMCase) (E.C. 3.2.1.4), exoglucanase (avicelase) (E.C. 3.2.1.91), and filter paper enzyme (FPase). As a result, Monascus has a great potential to produce bioactive compounds, alter the ratio of nutritive and anti-nutritive compounds of the substrates, and to change their bioavailability by SSF. A lot of agro-industrial wastes such as cereal bran (e.g., rice bran, wheat bran, and cassava powder) and oil by-products (e.g., coconut oil cake, sesame oil cake, palm kernel cake, and groundnut oil cake) have been screened for Monascus fermentation (Babitha et al. 2007; Daroit et al. 2007; Silveira et al. 2008; Velmurugan et al. 2011; Srianta et al. 2014; Haque et al. 2016; Srianta et al. 2016). Like these materials, SBSR has a similar composition, including cellulose, hemi-cellulose, lignin, starch, and pectin (Soccol et al. 2017). Preliminary tests have shown that Monascus grow well on SBSR. In the available literature, there has been only one study on the reuse of SBSR (Ushakova et al. 2009). No effort has been made, so far, to utilize filamentous fungi as the decomposer of SBSR. Clearly, it is important to conduct thorough research on SBSR solid-state fermentation. The main subject of this study was to evaluate the effects of the fermentative factors on fungi growth, enzyme activities, and the active compound levels extracted from the fermented SBSR. The antioxidant activities of the extracts from fermented and unfermented SBSR were also studied. The objective was to develop a potential biotechnological route for the reuse of SBSR. Monascus purpureus M-1 was isolated from commercial Monascus-fermented rice and identified as Monascus purpureus (ATCC Number: 16365). Before use, the M-1 strain was cultivated and maintained on Potato Dextrose Agar (PDA) slant at 30 °C for 7 days, and spore suspensions were prepared with proper spore counts for solid-state fermentation. The SBSR were obtained from General Health Bioscience (Xining, China), and were obtained from a supercritical extracting line of sea buckthorn seed oil. Fermentation was conducted in Erlenmeyer flasks (50 mL). The SBSR were washed and dried before 10 g were taken as the substrate for SSF. All experiments were performed in triplicate. The effect of the fermentation time was discussed at the normal condition as follows. Distilled water was added to adjust the water content to 60%. The pH value was 5.0. The inoculum size was 1 mL spore suspension, with a spore density of 3.2 104/mL. The inoculated flasks were closed and incubated at room temperature (25 to 28 °C). The fermentation time was within a range of 0 to 18 days. The effect of the water content was evaluated under the following conditions. The pH value was 5.0. The inoculum size was 1 mL spore suspension, with the spore density of 3.2 104 /mL. Distilled water was added to adjust the water content from 40% to 80%. The inoculated flasks were closed and incubated at room temperature for 15 days. The effect of the inoculum density was evaluated under the following conditions. The pH value was 5.0. Distilled water was added to adjust the water content to 60%. The inoculum size was 1 mL spore suspension, with the spore density ranging from 1.28 103 to 8.00 105/mL. The inoculated flasks were closed and incubated at room temperature for 15 days. The effect of pH was evaluated under the following conditions. The inoculum size was 1 mL spore suspension, with the spore density of 3.2 104/mL. Distilled water was added to adjust the water content to 60%. The pH of the substrate was adjusted from 3.0 to 12.0. The inoculated flasks were closed and incubated at room temperature for 15 days. The biomass was estimated by determining the amount of N-acetyl glucosamine released by the acid hydrolysis of chitin, present in the mycelia cell wall of the fungi (Sakurai et al. 1977). Chitin hydrolysis was carried out by using sulfuric acid in a boiling water bath for 60 min. The hydrolysate was neutralized to pH 7.0. The acid hydrolysis sample was used in the following steps, based on the literature (Velmurugan et al. 2011). The results were expressed as milligrams of N-acetyl glucosamine per gram of the dry weight sample (mg glucosamine/g DW). The dried and de-stoned fermented residues (1 g) were extracted with 8 mL of distilled water at room temperature for 1 h in an ultrasonic bath. After centrifugation (at 4000 g for 10 min) and filtration of the supernatants, the filtrates were stored (at 4 °C) until the aqueous bioactive compounds were analyzed. The determination of the total sugar contents was performed by the phenol-sulfuric acid method. Specifically, the extracted samples (2 mL) and the phenol solvents (5%, 1 mL) were mixed. Then, 5 mL of sulfuric acid was added and mixed again. The reaction system took place in a boiling water bath for 60 min. The absorbance was measured at 490 nm, and the total sugars were quantified by calibrating against the standard glucose solution. The results were expressed as milligrams of glucose equivalents per gram of the dry weight sample (mg GE/g DW). The amount of reducing sugars was performed by the dinitrosalicylic acid (DNS) method of Miller (1959) with a little modification. Specifically, the extracted samples (1 mL) and the DNS solvents (2 mL) were mixed thoroughly and reacted in a boiling water bath for 5 min. The absorbance was measured at 520 nm, and the monosaccharide content was quantified by calibrating against the standard glucose solution. The results were expressed as microgram glucose equivalents per gram of the dry weight sample (μg GE/g DW). The determination of the polypeptide content was performed by the Bradford method (Bradford 1976). The polypeptide content was quantified by calibrating against the Bovine Serum Albumin (BSA) solution. The results were expressed as milligram BSA equivalents per gram of the dry weight sample (mg/g DW). The dried and de-stoned fermented residues (1 g) were extracted with 8 mL 80% ethanol at room temperature for 1 h in an ultrasonic bath. After centrifugation (at 4000 × g for 10 min) and filtration of the supernatants, the filtrates were stored (at 4 °C) until the non-aqueous bioactive compounds were analyzed. The determination of the total flavonoid contents was performed according to the protocol of Park et al. (2008). The total flavonoids were quantified by calibrating against the standard rutin solution and were expressed as milligrams of rutin equivalents per gram of the dry weight sample (mg RE/g DW). The phenolic levels were measured by using the Folin-Ciocalteu reagent according to the protocol of Singleton et al. (1999). The total phenolics were quantified by calibrating against the standard solution and were expressed as milligrams of gallic acid equivalents (GAE) per gram of the dry weight sample (mg GAE/g DW). The procyanidins were measured by a colorimetric assay according to the method described in a previous report with catechin as the standard (Sun et al. 1998). The results were expressed as milligrams of catechin equivalents per gram of the dry weight sample (mg CE/g DW). where A1 is the absorbance in the presence of SBSE, A2 is the absorbance of the control (without SBSE), and A3 is the absorbance without DPPH. The ABTS*, 2,2-azino-bis (3-ethylbenzothiazoline-6-sulfonic acid) diammonium salt radical cation de-colorization test is a spectrophotometric method that is widely used to assess antioxidant activity. The ABTS* radical scavenging activity measurement used in this study was based on a previous report (Thomas et al. 2013), with some modifications (Wang et al.2016). The ABTS* radicals were generated by the oxidation of ABTS using potassium persulfate. The stock solution of ABTS* was obtained by adding 88 μL of potassium persulfate (140 mM) to 5 mL ABTS solution (7 mM) in the dark for 16 h. The working solution of ABTS* was obtained by diluting the stock solution in ethanol to an absorbance at 734 nm of 0.70±0.02 before use. where A1 is the absorbance in the presence of SBSE, A2 is the absorbance of the control (without SBSE), and A3 is the absorbance without ABTS*. Twenty-five milliliters of sodium acetate buffer (50 mM, pH 6.5) were mixed with 5 g of fermented samples. After shaking at 120 rpm, 30 °C for 30 min, the extract was filtered and the suspension was centrifuged (at 12000 × g for 30 min at 4 °C) and filtered. The filtrate containing crude enzyme was stored at 4 °C. The LiP activity was determined according to Tien and Kirk (1984) with a few modifications. Veratryl alcohol (Aldrich, 96%) was used as a substrate. The reaction mixture contained 3.2 mL of sodium tartrate buffer (125 mM, pH 3.0), 100 μL of veratryl alcohol (10 mM), 100 μL of H2O2 (10 mM), and 0.6 mL of enzyme extract. The reaction was initiated by adding H2O2. The oxidation rate of veratryl alcohol was measured with a UV-VIS spectrophotometer (UV-1200, Shimadzu) at 310 nm. One unit of LiP activity (U) was defined as the increase of 0.1 OD value per milliliter per minute at 30 °C. The MnP activity was measured according to Kuwahara et al. (1984) with a few modifications. The reaction mixture contained 3.4 mL sodium lactate buffer (50 mM, pH 4.5), 100 uL of Mn sulfate (1.6 mM) (or an equimolar amount of EDTA for control), 100 uL of H2O2 (10 mM), and 0.4 mL of enzyme extract. The reaction was initiated by adding H2O2. One unit of MnP activity (U) was defined as the increase of 0.1 OD value per milliliter per min at 30 °C. The Lac activity was determined according to Coll et al. (1993) with guaiacol as a substrate. A few modifications were made to the method. The reaction mixture contained 1.5 mL sodium acetate-acetic acid buffer (50 mM), 1.0 mL of guaiacol (10 mM), and 1.0 mL of enzyme extract. The oxidation of guaiacol to the polymer tetraguaiacone was monitored by increase in absorbance at 470 nm. One unit of Lac activity (U) was defined as the increase of 0.01 OD value per milliliter per minute at 30 °C. CMCase and avicelase activities were measured according to Beukes and Pletschke (2006). The enzymatic activities were measured using respective substrates (sodium carboxymethylcellulose and avicel for CMCase and avicelase, respectively). The FPase was determined according to Ghose (1987), with filter paper as a substrate. The cellulases activities were calculated by estimation of reducing sugars liberated from substrates by the DNS method (Miller 1959). One unit (U) of cellulase activity was defined as the amount of enzyme required to produce one μmol of reducing sugar (glucose) per min at 50 °C. Data analysis was performed using the SPSS 19.0 program (SPSS, VERSION 19.0, Inc., Chicago, IL, USA). All tests were conducted in triplicate, and the results were expressed as mean ± standard deviation (SD). Comparisons between the samples were analyzed with a one-way analysis of variance (ANOVA), followed by the Duncan test. The differences were considered significant at P < 0.05 and explained by different upper and lower case letters in the figure. Microorganisms require certain nutritional conditions in order to have normal growth, reproduction, and the completion of a variety of physiological needs. Although nutritional components are needed for microbes, many environmental factors are also important for the survival and growth of microorganisms (Soccol et al. 2017). These factors include temperature, pH, aeration, water activity, and the nature of the solid substrate employed, including the particle size, etc. (Pandey 1991; Thomas et al. 2013). Figure 1 shows the effects of fermentation time on biomass and the bioactive compound contents in non-aqueous and aqueous extracts of fermented residues. Based on Fig. 1A, the growth curves of M-1 followed the same lag, logarithmic, stationary, and aging phases as in other microorganisms. After inoculation, 1 to 3 days was the latent phase, 4 to 10 days was the logarithmic phase, and the stagnate phase was from 11 days. The total phenols and flavonoids showed similar tendencies during the fermentation time (Fig. 1B).The amounts of the total phenols increased dramatically, until the maximum yield was reached of (2.71 ± 0.13) mg GAE/g DW on day 9. A low phenolic content was observed at the beginning, which could be explained by the fact that the phenols existed predominantly in the membrane bound form and only a low amount was in the free soluble form (Dulf et al. 2016). Fig. 1. Effects of fermentation time on biomass (A), non-aqueous bioactive compound content (total phenols, flavonoids, and procyanidins) (B), aqueous monosaccharide and polypeptide content(C) and total sugar (D) content. Each value represents the mean ± SD (n = 3). Values with different superscripts are significantly different (P < 0.05). Many enzymes secreted by microbes degrade the cell walls of the substrates, which mobilizes phenols to react with the Folin-Ciocalteu reagent (Wang et al. 2017). The activities of ligninolytic and cellulosic enzymes were measured, and the results are shown in Fig. 6. LiP and FPase were the key enzymes catalyzing the oxidative degradation of lignin and cellulose from SBSR, respectively (Fig. 6A and B). The highest Lip and FPase activities were obtained on days 9 and 7, respectively. The above results were consistent with the variation tendency of non-aqueous bioactive compounds (except for procyanidins). It is known that enzymes have played key roles in breaking the SBSR cell walls, which leads to the liberation of insoluble-bound phenolics, transforming them into soluble-free phenolics (Bhanja et al. 2009; Singh et al. 2010). Similar results have been reported (Dey et al. 2016; Dulf et al. 2016; Huang et al. 2016; Sandhu et al. 2016). A decrease of the total phenol content was observed after 10 days of fermentation, possibly due to the degradation of carbon sources (e.g., tannins and phenols) to aliphatic compounds (Saxena et al. 1995; Bhat et al. 1998). Vattem et al. (2004) pointed out another reason for the decline, suggesting polymerization of the released phenols by oxidative enzymes, activated as a response to the stress induced on the fungus due to the nutrient depletion. The total flavonoid contents increased to the maximum yields of 1.83 ± 0.29 mg RE/g DW after about 11 days of SSF. Similarly, a substantial increase in the levels of the total flavonoids was also reported by Dulf et al. (2016) in Aspergillus niger and Rhizopus oligosporus-fermented plum fruit by-products. 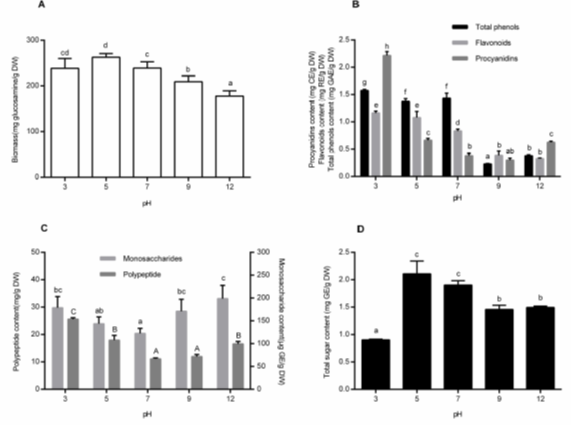 However, the procyanidins content showed a stable decrease during fermentation (Fig. 1B). The structure of the procyanidins contains lots of phenol hydroxyl groups, which are easily destroyed by sterilization or by oxidative enzymes generated from fermentation (Hummer and Schreier 2008). Figure 1C shows the effects of fermentation time on monosaccharide and polypeptide contents. There was a significant decline in the content of monosaccharides (876.14 ± 17.77 μg GE/g DW at day 0 to the minimum of 13.67 ± 17.77 μg GE/g DW at day 11) and the content of polypeptides (21.17 ± 0.14 mg/g DW at day 0 to the minimum of 12.39 ± 0.51 mg/g DW at day 11). With SSF, the contents of monosaccharides and polypeptides remained stable after 13 days (P > 0.05). Previous studies suggested that the type and concentration of carbon and nitrogen sources affected the growth of fungus (Lee and Pan 2012). Monosaccharides are commonly used as the major carbon source (Khosravi et al. 2015), which was the reason for the decrease at the beginning of SSF (before 5 days). During the 9th and 7th days of fermentation, the activities of LiP and FPase increased, which induced the production of monosaccharide by decomposition of the substrate. The balance of the two parts led the content of the monosaccharides in a dynamic equilibrium. Khosravi et al. (2015) draw the same conclusion. The polypeptide content decreased because of the decomposition by protease released from the SSF. Similarly, the new polypeptides gradually increased, partly resulting from the decomposed substrates and partly from the extracted polypeptides in the mycelium. Total sugar contents in the substrate extracts were evaluated (Fig. 1D). There was a dramatic decrease at the beginning and a gradual increase. The growth of fungi requires sugars as carbon sources, which made total sugar content decrease. Meanwhile there were other sugars present in the substrates, possibly released by the enzymes generated, which made the content increase. Similar results were obtained by de Vries and Visser (2001). For SSF, the water content of the substrates is a key parameter to control the growth of the microorganism and metabolite production (Pandey 2003). Higher water content in SSF decreases substrate porosity and prevents oxygen penetration. This may induce bacterial contamination. However, lower moisture results in reducing solubility of the metabolites, restricting heat exchange, and in the declining of the availability of nutrients to the culture (Babitha et al. 2007). This ultimately affects the growth of the microorganism. The effect of initial water content on biomass is shown in Fig. 2A. Maximum biomass was observed at 60% water content (262.91 ± 6.54 mg glucosamine/g DW). Results agreed with the theory that, generally, fungal and yeast cultures have lower water activity (aw) requirements, typically around 0.5 to 0.6 aw. There will be some differences when studying different Monascus strains or different metabolites. Babitha et al. (2007) reported that the optimum initial moisture content of M. purpureus LPB97 for pigment production was 50%. To obtain high activities of α-amylases, the optimal water content of the Aspergillus sp. was 80%, based on Ellaiah et al. (2002). However, the highest activity of LiP was detected at 50% to 60% water content in the study, and the highest activity of CMCase was obtained at 60% water content. The total phenols, flavonoids, and procyanidins were examined with different water content (Fig. 2B). The maximum contents of total phenols (2.53 ± 0.09 mg GAE/g DW), flavonoids (3.69 ± 0.07 mg RE/g DW), and procyanidins (3.94 ± 0.09 mg CE/g DW) were all observed at the condition of 80% water content. That might be because of the low activities or the low content of phenol oxidases. Phenol oxidases are distributed widely in fungi and plants, and they participate in lots of processes such as lignin degradation. The most prominent phenol oxidases are ligninolytic enzymes, such as laccases (Sinsabaugh 2010). Ligninolytic enzymes not only can liberate insoluble-bound phenolics by breaking cell walls, they also can catalyze the decomposition of phenol and its derivatives (Martínková et al. 2016). According to Martínková (2016), tyrosinases are another type of enzymes playing key roles in degrading phenolics. Results in Fig. 6 (E and F) showed low activities of ligninolytic and cellulolytic enzymes at 80% water content, which resulted in weak degradation of phenols. In contrast, the major ligninolytic enzyme in SSF of SBSR was LiP rather than Lac. This is because that laccase production usually occurs along with the secondary metabolism of fungi and is influenced by different factors, e.g. substrate types, culture time, and fungal species (Rivera-Hoyos et al. 2013). It is reported that the increase in laccase activity occurs together with a codependent increment in fungal growth (Rivera-Hoyos et al. 2013). After a period of SSF, the maximum contents of monosaccharides (855.70 ± 31.48 μg GE/g DW) and polypeptide (41.00 ± 2.76 mg/g DW) were all observed at 80% water content (Fig. 2C). The assumed reason was that the insufficient growth of the fungi led to less consumption of the nutrients and released a small amount of hydrolases. The total sugar content got a relatively high level at 60% to 70% water contents (1.63 ± 0.21 mg GE/g DW to 1.80 ± 0.11 mg GE/g DW), where the fungi M-1 released a large amount of enzymes to degrade for the growth and reproduction (Fig. 2D). Figures 6E and 6F showed the enzymes activities at different water contents. Fig. 2. 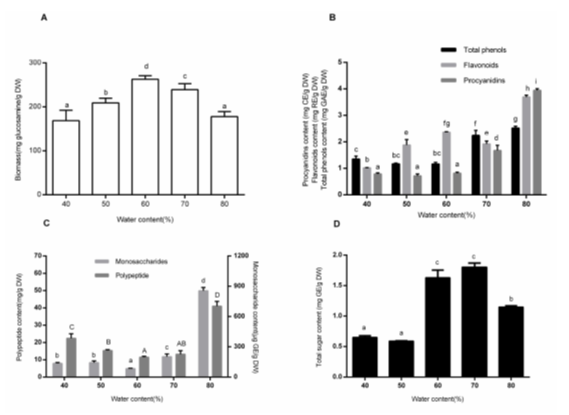 Effects of water content on biomass (A), non-aqueous bioactive compound content (total phenols, flavonoids, and procyanidins) (B), aqueous monosaccharide and polypeptide content(C) and total sugar (D) content. Each value represents the mean ± SD (n = 3). Values with different superscripts are significantly different (P < 0.05). Many studies have shown the effect of inoculum density on fungal growth or on product yield in SSF. In this study, the biomass of M-1 was evaluated after a period of fermentation (Fig. 3A). Inoculating with 1 mL spore suspension ranging from 1.28 × 103 to 3.20 × 104 /mL resulted in insufficient biomass. The results agreed with the theory that low inoculum density leads to deficient biomass and decreased target product. The maximum was observed at an inoculum size of 1 mL spore suspension (1.6 × 105 /mL). There was no significant difference when the inoculum density reached up to 8.00 × 105 spores/mL. The results of inoculum density on the total phenols, flavonoids, and procyanidins are shown on Fig. 3B. The maximum contents of total phenols (2.89 ± 0.05 mg GAE/g DW) and flavonoids (1.87 ± 0.03 mg RE/g DW) were obtained at the inoculum spore density of 6.4 × 103 /mL, followed by 1.28 × 103 /mL. The amount of procyanidins decreased with the inoculum density increase. As is well known, high inoculum density is sufficient for fungi growth and is conducive for the production of enzymes to decompose carbon sources. Probably, the results were due to the oxidative enzymes (ligninolytic enzymes, such as LiP) degrading phenols, flavonoids, or procyanidins (Martínková et al. 2016). In the study, the highest activities of ligninolytic and cellulolytic enzymes were both observed at the inoculum spore density of 8.0 × 105 /mL. However, low activities of LiP and FPase at low inoculation density were observed (Figs. 6C and D). Fig. 3. Effects of inoculum size on biomass (A), non-aqueous bioactive compound content (total phenols, flavonoids, and procyanidins) (B), aqueous monosaccharide and polypeptide content(C) and total sugar (D) content. Each value represents the mean ± SD (n = 3). Values with different superscripts are significantly different (P < 0.05). The contents of the monosaccharides and polypeptides followed a similar tendency. They all decreased with the increase of inoculum density (Fig. 3C). This was attributed to the increasing amount of hydrolase (cellulolytic enzymes, such as FPase) released to degrade these compounds with the increase of the microbes. The total sugars were reduced at low inoculum density and increased at the density above 3.2 × 104 /mL (Fig. 3D). The reasons for this phenomenon might be the imbalance between the sugars expended and the new sugars produced. Substrate pH is another key parameter to determine microbial growth in SSF. As for the substrate pH, the Monascus species can grow in a wide range, from 3.0 to 12.0. The optimal substrate pH varies with the substrate types and fungi species. In this study, the effects of different substrate pH levels were investigated (Fig. 4A). The optimal pH for growth was 5.0, with the biomass reaching up to 260.11 ± 11.54 mg glucosamine/g DW. However, high levels of LiP and FPase activities were observed at pH 7.0 through 9.0 (Figs. 6G and 6H). The results reflected the inconsistency of optimal pH for different purposes. Babitha et al. (2007) reported that N-acetyl glucosamine concentration was the greatest at a pH of 5.0 (270 mg/gdfs), when using jack fruit seed as the substrate. These results were consistent with the present study. At an alkaline pH (9.0 to 12.0), there was a decrease in the growth profile (Fig. 4A). Fig. 4. Effects of pH on biomass (A), non-aqueous bioactive compound content (total phenols, flavonoids, and procyanidins) (B), aqueous monosaccharide and polypeptide content(C) and total sugar (D) content. Each value represents the mean ± SD (n = 3). Values with different superscripts are significantly different (P < 0.05). Figure 4B shows the effects of pH on the total phenols, flavonoids, and procyanidins in the non-aqueous extracts. The maximum contents were all observed at a pH of 3.0 (total phenols, flavonoids, and procyanidins were 1.57 ± 0.02 mg GAE/g DW, 1.16 ± 0.03 mg RE/g DW and 2.21 ± 0.07 mg CE/g DW, respectively). Kim et al. (2006) and Zhao et al. (2017) obtained similar results about the total phenol and flavonoid content. Each study agreed that lots of combined phenols can be released by hydrolyzing under acidic conditions. Procyanidins in alkaline conditions showed a dramatic decrease because of the polyhydroxy structure. It could be easily degraded by oxidative enzymes from microbes when in a pH range of 5.0 to 7.0. When discussing the effect of pH, levels of monosaccharides and polypeptides peaked at both sides and decreased in the middle pH groups (Fig. 4C). The sugar contents of the substrates peaked at the middle of the pH groups and decreased in acidic conditions (Fig. 4D). The consistent features were that the declines appeared usually at the point of the insufficient growth of the fungi. This was assumed to be because a lesser number of degraded enzymes were generated when there was insufficient growth of microorganisms. Antioxidant activity is strongly connected with the presence of the total phenolics, flavonoids, anthocyanins, procyanidins, polypeptides, monosaccharides, and other active compounds (Huang et al. 2013; Chi and Cho 2016; Dulf et al. 2016). Fermentation has a positive effect on the antioxidant activity of different plant-based matrices, and the degree of influence depends on the species of the microorganism (Bei et al. 2017; Zhao et al. 2017). In a study by Wang et al. (2017), the DPPH and ABTS* radical-scavenging activity of fermented guava leaves was dramatically increased because of the increased release of the total polyphenol components. According to Huang et al. 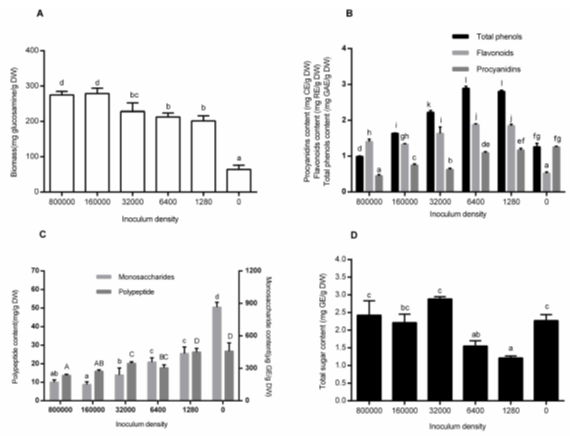 (2013), Monascus purpureus-fermented residual sorghum showed a remarkable antioxidant activity on mouse embryonic liver cells. Fig. 5. DPPH (A) and ABTS* (B) radical scavenging activities of non-aqueous and aqueous extracts at different concentrations. The fermented residues were obtained in the condition as follows: 10 g substrate with 60% water content, adjusted at a pH of 5.0, inoculated 1 mL spore suspension with the density of 3.2 × 104 /mL, and fermented at 28 °C for 15 days. Vc was chosen to be a positive control. Each value represents the mean ± SD (n = 3). The fermented samples contained plenty of active compounds, as exhibited in Fig. 2 through Fig. 4. It is not a contradiction that there have been no significant correlations between these active compounds and their antioxidant capacity in previous literature (Vattem et al. 2004; Kim et al. 2006; Dulf et al. 2016). Fig. 6. The activities of ligninolytic and cellulosic enzymes in different conditions. The conditions include fermentation time (A, B), inoculum size (C, D), water content (E, F) and pH (G, H). Activities of ligninolytic enzymes (LiP, MnP and Lac) were shown in A, C, E and G. While, activities of cellulosic enzymes (FPase, Avicelase and CMCase) were shown in B, D, F and H. Each value represents the mean ± SD (n = 3). In this study, bioactive compounds were divided into four groups, aqueous, non-aqueous, and their unfermented counterparts. The DPPH and ABTS scavenging activities of four freeze-dried extracts were discussed, using vitamin C (Vc) as the positive control (Fig. 5). The same dosage of extracts (no matter which type of extracts) showed a much higher scavenging ability of ABTS* radicals than that of DPPH radicals. The concentration of the freeze-dried powders induced the scavenging activities of DPPH free radicals in a dose-dependent manner (Fig. 5A). Although Vc showed a much higher DPPH removal efficiency (IC50 = 33.49 μg/mL), the activities for DPPH removal in fermented non-aqueous extracts (IC50 = 47.16 μg/mL) or aqueous extracts (IC50 = 64.25 μg/mL) were increased compared with those in the unfermented non-aqueous group (IC50 = 55.61 μg/mL), or the unfermented aqueous group (IC50 = 82.48 μg/mL). Similar results were obtained on scavenging the ABTS free radicals (Fig. 5B). The ABTS* radical assay is an important tool to determine the anti-oxidative activity of hydrogen-donating molecules (Chi and Cho 2016). An increase in the dosage of the extracts promoted these activities. The activities of the fermented non-aqueous or the aqueous extracts for ABTS* radical removal were much higher than the unfermented groups. At a dose of 90 μg/mL, the activities of non-aqueous extracts for ABTS* radical removal reached from 64.70% ± 3.52% (unfermented) to 85.46% ± 1.13% (fermented) (P < 0.05). Additionally, the activities of the aqueous extracts reached from 71.98% ± 1.57% (unfermented) to 84.38% ± 3.92% (fermented) (P < 0.05). After bioconversion, the increased activities for DPPH and ABTS+ radical removal agreed with those found in other studies (Chan et al. 2007; Wang et al. 2016). Monascus purpureus M-1 was able to take advantage of sea buckthorn seed residues. There was enhanced antioxidant ability after fermentation. The relationship between the fungal growth and the compounds levels was determined. Enzyme activities played an important role in the decomposition of SBSR. The unsuitable fermentation conditions (improper parameters for the biomass) caused weak growth of the fungi and poor degradation of the substrates. Thus, the maximum content of the compounds discussed in the study was reached, usually in poor conditions. The total phenols and flavonoids were increased first in the latent and logarithmic phases of fermentation, and then decreased with the development of SSF. The changes of the total sugar levels had a contrary trend with the changes of the total phenol and flavonoid contents. The microbes’ decomposition on fibrous matter have played key roles in breaking the cell walls of the substrate, which leads to the liberation of the insoluble phenolics. The contents of the monosaccharides and polypeptides both decreased dramatically and then kept steady during the course of fermentation. This work was supported by the National Natural Science Foundation of China (NSFC, Grant No. 31571801), National Key Research and Development Program (Grant No. 2018YFD0400403), the and Science and Technology Achievement Transformation Upgrade Project (PXM2018−014213000033), and the Open Research Fund Program of Beijing Key Lab of Plant Resource Research and Development, Beijing Technology and Business University. Bhanja, T., Kumari, A., and Banerjee, R. (2009). “Enrichment of phenolics and free radical scavenging property of wheat koji prepared with two filamentous fungi,” Bioresour. Technol. 100, 2861-2866. DOI: 10.1016/j.biortech.2008.12.055. Epub 2009 Feb 15. Coll, P. M., Fernandezabalos, J. M., Villanueva, J. R., Santamaria, R., and Perez, P. (1993). “Purification and characterization of a phenoloxidase (laccase) from the lignin-degrading Basidiomycete Pm1 (Cect-2971),” Appl. Environ. Microb. 59, 2607-2613. DOI: 10.0000/PMID8368848. Srianta, I., Ristiarini, S., Nugerahani, I., Sen, S. K., Zhang, B. B., Xu, G. R., and Blanc, P. J. (2014). “Recent research and development of Monascus fermentation products,” Int. Food Res. J. 21, 1-12. Article submitted: August 3, 2018; Peer review completed: October 11, 2018; Revised version received and accepted: January 12, 2019; Published: January 30, 2019.